Examining eyes door to door in a village. PAKISTAN. © Jamshyd Masud/Sightsavers. The burden of avoidable blindness is borne largely by the developing world: 90% of the world’s visually impaired live in low-income countries. According to the World Health Organization, 285 million people worldwide suffer from visual impairment and, amongst them, 39 million people are blind.1 In Africa there are 27 million visually impaired people, and nearly 7 million who are blind. Yet, in 80% of cases, visual impairment could be cured or could have been prevented. Over the past ten years, it has become clear that capacity building in developing countries – and specifically the training of national eye health personnel – is essential to the elimination of avoidable blindness. Without it, we will not be able to significantly and lastingly reduce the burden of avoidable visual impairment. There is also a lack of relevant training materials for personnel working in these resource-poor contexts. 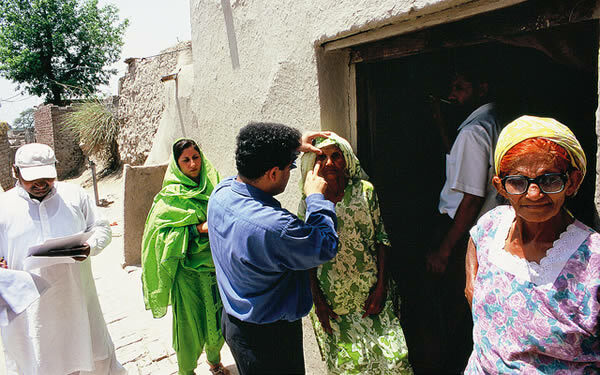 The Community Eye Health Journal is an important aid to capacity building in low and middle income countries: it provides up-to-date and relevant information to eye care workers, refreshes skills learnt many years previously, shares good practice and motivates people to reach beyond the eye clinic and into communities – thereby improving the eye care and health outcomes of people throughout the developing world. 90% of respondents agreed that the journal had improved and/or supported their work, and 80% said that something they read in the journal had led them to change their clinical practice or management of patients. 80% agreed that the journal had motivated them to reach out to the community, 75% that it had changed the way they conducted health education, and 70% agreed that it had changed the way they talked to patients, that it had stimulated them to talk to non-eye care colleagues, and that it had motivated them to stay in eye care. To find out more about the impact of the journal download the summary report of our 2011 reader survey, available on the Reports page.